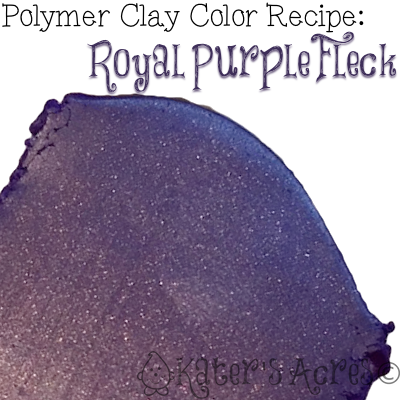 Royal Purple Fleck polymer clay color recipe for Premo polymer clay is a velvety purple color with just a hint of metallic. It’s vivid purple color will help to pull color to it. This cool toned purple is sure to be a winner in your next palette. These color recipes I’ve been bringing you every week sure are fun! I have always loved experimenting with color and bringing you new and exciting recipes is always a delight. I hope that this series has helped to embolden you to not be so afraid of color and to help you NOT reach for color straight from the pack, but be brave enough to mix your own. Discovering and finding new colors to play with isn’t as hard as you might think. If you haven’t read my recent article on Making a Color Palette 101, it’s an article you won’t want to miss. Be sure you don’t miss any of my free color recipes by visiting here. Add 2 parts additional Cobalt for a cooler & bluer purple. Add 1 part additional Gold for more metallic (please note that this is a yellow base and will brown out the purple slightly). Free polymer clay tutorials are made possible by Parker’s Clayful Tutorials Club Members.